[list icon=”moon-checkbox” color=”#ee1f24″]Inspect ductwork for leaks and seal them. [/list] [list icon=”moon-checkbox” color=”#ee1f24″]Check for refrigerant leaks. [/list] [list icon=”moon-checkbox” color=”#ee1f24″]Lubricate moving parts, such as the motor, and make sure the belts are tight and not worn down. [/list] [list icon=”moon-checkbox” color=”#ee1f24″]Check the filters, blower, indoor coil and ducts for dirt or other debris that can inhibit performance. [/list] [list icon=”moon-checkbox” color=”#ee1f24″]Measure airflow to make sure it is adequate. [/list] [list icon=”moon-checkbox” color=”#ee1f24″]Verify that the system’s refrigerant levels are appropriate. [/list] [list icon=”moon-checkbox” color=”#ee1f24″]Ensure that the thermostat is working properly. [/list] [list icon=”moon-checkbox” color=”#ee1f24″]Check the electric controls to ensure that the cooling mode is locked out when you are using your heating equipment, and vice versa. 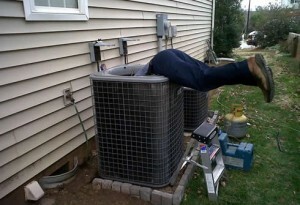 [/list] For more information about your heat pump or to have one of our expert HVAC technicians inspect it, contact General Air Conditioning Service Corp. We have proudly served Upstate South Carolina and the surrounding area since 1959.